Be a part of the effort to strengthen and grow the art and sport of Dragon and Lion Dance within the United States by sponsoring an event or donating to our organization! By supporting the USDLDF, your contribution will help us work towards our mission and vision of preservation and promotion of the art and sport by creating educational and competitive opportunities for its members throughout the US. All contributions are tax deductible as the USDLDF is a federally recognized 501(c)(3) entity. We need you to make this all happen. 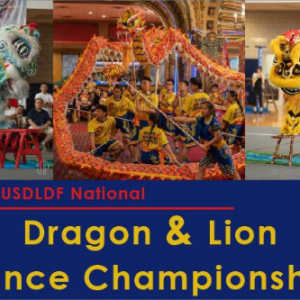 Established in 2017, the United States Dragon & Lion Dance Federation (USDLDF) is a non-profit organization that aims to preserve and promote the arts of dragon and lion dance as a cultural tradition and sport throughout the United States and abroad. Traditional Chinese dragon and lion dance dates back centuries, as a cultural practice to celebrate festivals and bring good luck and fortune to onlookers. Today, the art and sport of dragon and lion dance draws people from around the world to follow international competitions. Not only is online viewership high for lion dancing but the interest in preserving this ancient practice has a large following as well. Long-shi.com, a popular dragon and lion dance website, has a Facebook membership of over 100,000 and continues to grow. 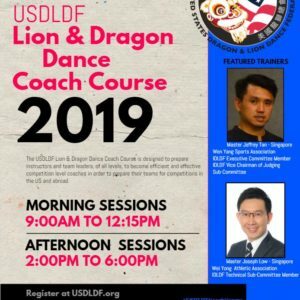 With the interest surrounding lion and dragon dancing, and the continuous growing popularity around the world, this is a good opportunity to cultivate and help it grow here in the United States. The first U.S. National Dragon and Lion Dance Competition took place this past May and was a tremendous success. There were 21 teams from 13 organizations from all across the nation that assembled in Boston, Massachusetts to showcase their hard-earned skills and abilities in the sport of lion dance. The success of the first tournament broke new ground on a national level and created a standard on how to preserve and promote the art of lion dance in the United States. 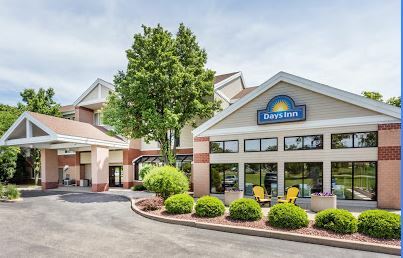 Madison’s progressive nature, rich cultural diversity and welcoming environment make it an ideal choice to host the 2019 tournament. This three-day event, from June 28th through the 30th, will begin with entertainment for our guests to help them unwind and prepare for the competition ahead. Tentative activities include a night of dinner and drinks at one of our many downtown establishments, and a seminar on the art of lion dance, which will intrigue guests and inspire competitors. The remainder of the weekend will be dedicated to competition at the spectacular Monona Terrace. A variety of teams from all over the United States will showcase their skills in traditional lion dance, freestyle lion dance, dragon dance, and drumming. In between events, competitors and spectators can unwind by checking out the local food and entertainment surrounding our state’s capitol. The event culminates with a grand awards banquet. This family-friendly weekend will be sure to amaze everyone attending, particularly those unfamiliar with the art of dragon and lion dancing. Locally, the Zhong Yi Kung Fu Association (ZYKFA) has been performing dragon and lion dances throughout the Madison area for over 20 years. While primarily performing in the Madison area, ZYKFA has also performed for organizations as varied as the Green Bay Packers, the UW systems and public libraries and schools throughout Wisconsin. 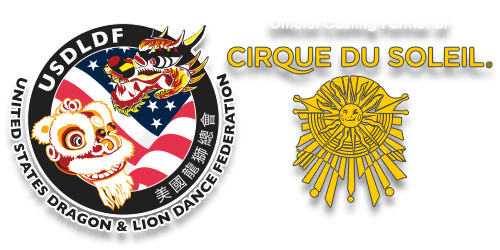 Most recently, they competed on the international stage, participating in the MGM Lion Dance Championship in Macau, China. The owner of ZYKFA, Nelson Ferreira has been promoting the art of lion dance worldwide and is a USDLDF Co-Founder and current President. He is honored to be able to share and promote the sport of lion dance by hosting the 2nd USDLDF Dragon & Lion Dance National Championship in his home city. 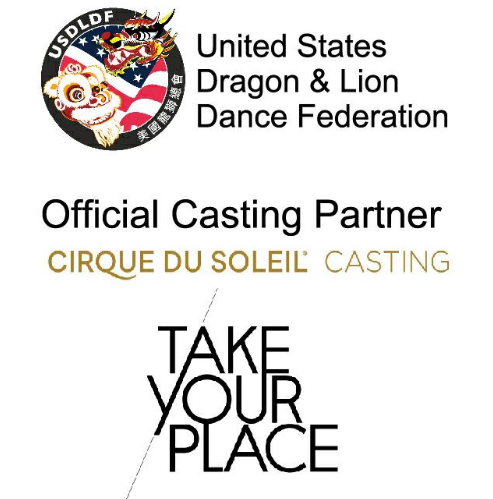 The USDLDF is extremely proud to showcase Madison on the world stage of dragon and lion dance and add to its rich history of hosting premiere cultural and sporting events. We ask for your support to help promote Madison’s diverse culture and to reaffirm the strength of our community. Sponsorship must be paid by 03/15/2019 to receive lion. For lion dance at company events: Local business only. Logos and Ads are due by 05/15/2019. Logo size and positions will be designated based on the level of sponsorship. Sponsors must provide their own advertisement file for program book. Ad placement in the program book is solely up to the USDLDF decision. Unless specified earlier, final sponsorship payments are due on 05/30/2019. Thank You for partnering with us and helping bring lion dance to the great city of Madison! The USDLDF accepts donations! All donations will receive an acknowledgement on our USDLDF website and, since we are a recognized 501(c)(3) organization, your contributions are tax deductible.